Emerging from a small riverside trading settlement of Bagobo tribes in southeastern Mindanao, the area we now call Davao City was claimed by the Spanish Crown in 1844 in opposition to the Sultan of Maguindanao, followed by the official colonization of the region in 1848. In the early 20th century, Japanese settlers thrived in the city working in abaca plantations so much so that it became pre-war Philippines’ “Little Tokyo” and, later, a bastion of Japanese forces during World War II. Heavily bombed by the Americans during the war, only a few heritage structures have survived. Today, Davao City – the largest in the Philippines in terms of land area – thrives with its diverse ethno-cultural landscape, the so-called “tri-people” consisting of indigenous lumad peoples, Muslim Moros, and Christian settlers from the Luzon and Visayas. Throughout the last decade, the city has been acclaimed to be one of the cleanest and safest with the iron-fisted leadership of the Duterte political family, making it an ideal place to explore on foot. A walking tour of the city’s poblacion district – the oldest part of Davao City – will provide a glimpse of its cultural influences and cosmopolitan aspirations. • Start your tour of downtown Davao at Museo Dabawenyo (free admission), housed in the former Court of First Instance built in 1953. The museum has interesting displays on indigenous clothing and photographs of pre-war landmarks throughout the city, many of which sadly did not survive WW-II and the proceeding industrialization of the city. Photography is not permitted inside the museum galleries. Note: For those interested in ethnography, one should also find time to visit the Davao Museum of History and Ethnography – admission: PHP 100 – located in Insular Village in Lanang, 7.3 km away from Museo Dabawenyo. • After a dose of history, science buffs may detour to a quirky museum along the southern stretch of San Pedro Street, traversing Quezon Boulevard. Started as a personal collection of an American missionary since he was a young boy, D’ Bone Collector Museum (entrance fee: PHP 50) opened in 2012, displaying over 500 skeletons of land and marine animals. Check out the skeletons of a 21-foot Burmese python and the colossal 41-foot sperm whale! The non-profit is active in environmental conservation and marine animal rescues in Mindanao. • Take a pedicab back to the corner of Quezon Boulevard, and walk past Osmeña Park to San Pedro Cathedral. The original structure was built in 1847 during the Spanish period, but was replaced with a concrete reincarnation created in the 1964 that draws inspiration from Muslim Moro culture. The mushroom-like façade was patterned after the vinta (Moro sailboat). • Turn right at C. Bangoy Street, and find the Oboza Heritage House tucked away at the corner of Rizal Street. The beautiful white abode, built in 1929, now houses an upscale French-Mediterranean restaurant called Claude’s Café de Ville. Main dishes are PHP 300 to 1500, but are well worth the splurge. • Head to People’s Park along Palma Gil Street to burn those calories after lunch strolling around its gardens, sculptures by local artist Kublai Millan, and the “durian dome”, a very modest answer to Singapore’s Esplanade Theatres by the Bay. This urban park is open from 5:30 to 10:00 AM, and 3:00 to 11:00 PM. • Walk up Claro M. Recto Avenue to Aldevinco Shopping Center, a popular tourist bazaar selling arts and crafts from across Mindanao (and even Indonesia) like pearl jewelry, Maranao woodwork and brassware, and versatile malongs (sarongs). • Four Chinese arches demarcate the boundaries of Davao’s Chinatown area, which centers on Ramon Magsaysay Avenue. From Aldevinco Shopping Center, turn right and walk through the Arch of Friendship. You can walk for 1.4 km down Magsaysay Avenue past restaurants serving noodles and siopao (meat buns), and dusty hardware stores owned by Chinese businessmen, or catch a short jeepney ride to the Arch of Unity across Magsaysay Park. • Feast on the iconic fruits of Davao, the durian and pomelo, at the Magsaysay Fruit Stands, near the entrance to the park. Gloria Fruit Stand towards the right side had the best durian prices during my visit at PHP 50 per kg, compared to PHP 80 per kg of the other stalls. • You can take out your durian and gobble it up while having a one-hour foot reflex massage at Magsaysay Park for only PHP 60. Enjoy getting pampered under a tree, while the sea breeze blows in from the Davao Gulf. 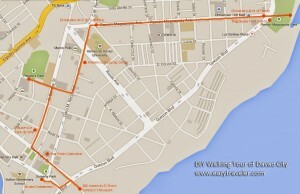 The perfect way to end your ramble around Davao’s downtown! HOW TO GET THERE: There are direct flights from Manila and Cebu to Davao City. Francisco Bangoy International Airport is located 40 minutes northeast of the Poblacion district. Taxi fare from the airport to poblacion is roughly PHP 180, or you can take two jeepney rides into the city center. Ask the driver for San Pedro Street. WHERE TO STAY: My Hotel and Daylight Inn are the cheapest sleeps, located along San Pedro Street, and a perfect home base for this walking tour. Single fan rooms with common toilet and bath are only PHP 250 at both guesthouses. For a more comfortable option, look for Bahay ni Tuding Inn & Resto through an alley off San Pedro Street. Rooms start at PHP 870 with air conditioning, WiFi, a hot and cold shower and cable TV. Continental breakfast is included. I like your guide to Davao. It gave me ideas what to do when I get there. I hope my trip next week will be awesome. Thank you, hope you had an incredible time in Davao!